SRINAGAR: On Monday when first of the four rounds of the ongoing municipal polls in Kashmir recorded 8.3 per cent of polling, it was considered an improvement over the last low that polling had recorded on April 9, 2017, when only 7.13 per cent voters participated in a by-poll that sent Dr Farooq Abdullah to the Lok Sabha. In Round 2 on Wednesday when a few areas went to polls, the overall participation across Kashmir was at three per cent, less than half of the Phase-I. But that never means the people did not vote. In Sumbal where 11 of the 13 municipal wards went to polls on Wednesday, it was jubilation. Hundreds of voters were lined up and, unlike Srinagar, every voter was willing to talk and flaunt the indelible ink mark on their fingers. There was a massive mobilisation of voters, obviously by the local political forces, mostly by “political rebels” and fortune hunters. Sumbal participation gave the election office the same ‘other side of the coin’ picture that Kupwara-Handwara combine fetched to the exercise in the first phase. There were men and women, young and old. Even the senior citizens were especially driven to the polling stations to ensure their right to vote is not devoured. But the most impressive part of Wednesday polling was that it was incident free. There was no violence anywhere barring a few small instances here and there. Barring one instance in which a voter was beaten by some angry young men in south Kashmir town, there was no report of any physical harm to any voter. People voted or stayed away from their own sweet will but the tension was in the air. It was this tension that led voters to avoid cameras and in most of the polling stations, the cops and the polling staff was very restrictive in permitting the media. Polling staff reported no attack anywhere across Kashmir, so far. Their entry into the habitations and their withdrawal after the day was over, was peaceful and incident free. However, at one place, the polling staff deployed in the marriage hall of Fateh Kadal alleged that they were pushing into the polling station and forgotten. “We had no food and we are hungry,” one polling officer said, without giving his name. “In the morning the local SHO came and he gave us a few sheets of thermocol and then we rested for a while.” Thermocol is soft plastic sheets which Kashmir normally uses under the flooring. Though the marriage hall had its own flooring, the room was locked and they could not break it open. “We spent the night talking to each other,” he said. The other interesting innovation was that the election office permitted polling from 6 am “if possible”. Kashmir recorded its sunrise at 6:32 am and this intervention in the process meant a fundamental shift. “It may or may not have led to any bogus voting but it actually conveyed that voting in pitch dark is possible in this place of the world,” one senior journalist said. The separaists had sponsored a strike but it was restricted to the areas where polling took place. People folowed it and it gave a grand mixed picture – shops open on one side of the road and a complete strike on the other side of it. Traffic played in non-poll areas and even the inter-district movemnet was on. There were 12 municipalities that went to polls today. But in seven municipalities, there was no polling either because these were left vacant or the single nominees took the seats already as winners. There was a partial contest in three municipalities and pretty serious in Srinagar and Sumbal where almost all the wards witnessed contested. 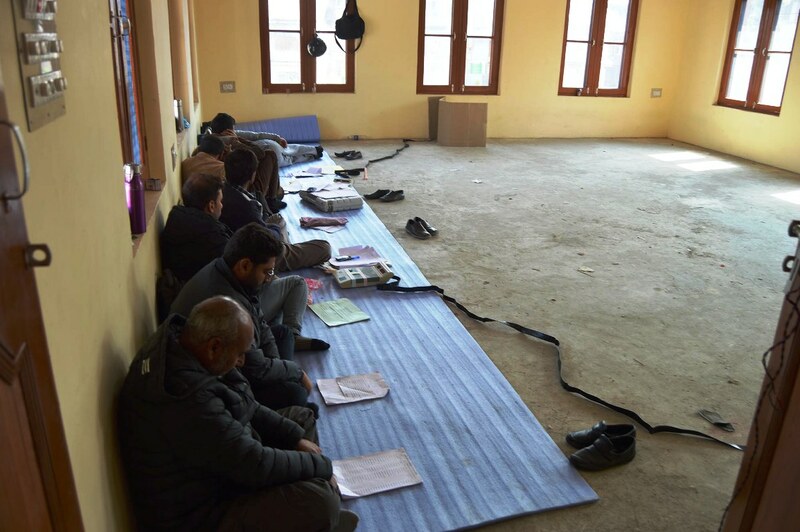 In Srinagar’s Chattabal ward, no voter came and in Tankipora, Syed Ali Akbar there were only eight voters each, a statistical report being circulated on social media said. 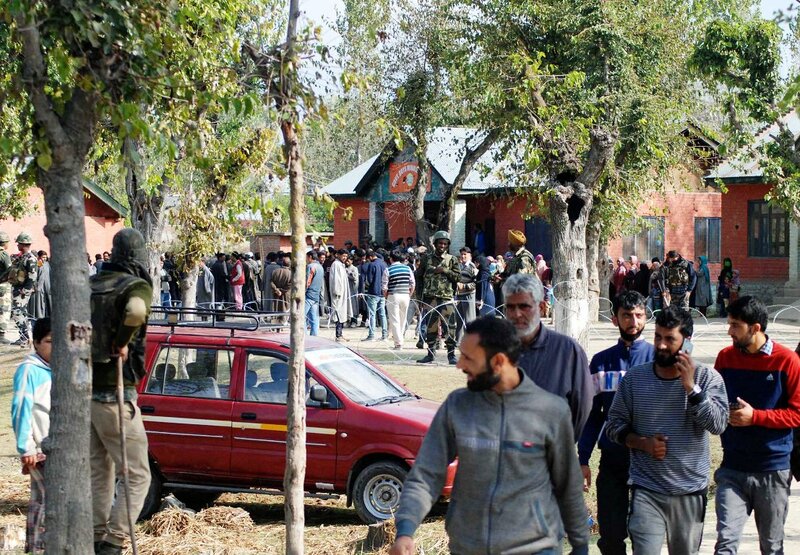 There were 28 votes in Fateh Kadal, 54 in Basantbagh, 68 in Nund Reshi Colony, 71 in Kaan Nagar, 88 in Sheikh Dawood Colony, 62 in Ziyara-e-Batamaloo and 84 in Aloochibagh, according to the same list. All other wards had more than 100 with the highest 1020 in Lawaypora. Srinagar overall recorded 2.2% polling. South Kashmir Anantnag polled 1.3 per cent and participation in Watergam’s lone ward was 7.03 per cent (only 19 voters reported, all male); in Langate 33 votes were polled out of 650 and in Sumbal 35.6 per cent polling, the highest, was reported/. In Chenab Valley, however, people came in hoards to vote. Reports reaching from the belt suggest that in Bhaderwah, the contest is between BJP and Congress; in Kishtwar, it is independent versus the BJP and in Doda, the contest is triangular between BJP, Congress and an independent, Independent in these areas means either NC or PDP, locals said. Hashmi said it is was part of BJP’s electoral malpractice to convey to its people that they have even bundled the DC out and this very order was hugely responsible for a mass vote against the BJP. The region is facing sort of an identity crisis after the BJP swept away all the Chenab Valley seats in 2014 assembly polls, barring Inderwal. Though this has triggered a serious rethink, the ground report suggests that a sort of division still exists on the ground. State’s Chief Electoral Officer (CEO), Shaleen Kabra said that overall 31.3% polling was witnessed in the Phase-II of Municipal Polls-2018 across Jammu and Kashmir. Kabra said in Jammu division 78.6% polling was witnessed in 214 wards and Kashmir division witnessed average 3.4% polling in 49 wards with Bandipora recording the highest 35.6% voting. In Jammu division highest polling percentage of 84.4% was recorded in Reasi, the CEO said. He said the cumulative for the two phases polling percentage till date is 47.2% with 67.7% voting recorded in Jammu division and 8.3% in Kashmir. The CEO said that 544 polling stations were designated across the State for Phase-II with 270 polling stations in Kashmir and 274 in Jammu. He said 1029 candidates are in the fray for 263 Municipal Wards for Phase-II with 881 candidates in Jammu division and 148 in Kashmir division for Phase-II.